The roof of the world-famous Notre-Dame Cathedral is in flames, high smoke clouds rise into the sky. Hundreds of firefighters are working to bring the fire under control and save valuable art treasures. the world-famous Cathedral of Notre-Dame in Paris, a devastating fire broke out. About the landmark of the French capital in a huge column of smoke to see flames from the attic. From the two great towers of the Cathedral of black smoke. A vast area of ash went down. According to the AP news Agency, the fire has reached one of the two main towers. Behind its stained-glass Windows, and flames were visible. According to the Ministry of the interior, the fire service is a large contingent on site. About 400 firefighters are trying to stem the fire. The police stated that some firefighters are fighting in the building against the flames, others from outside. About possible injured is still not known. ARD-correspondent Mathias Werth reports, the rear part of the Church stand under the water. The two main towers were only affected to a certain extent: In the North tower fire broke out. The main nave of the Church was on fire. There 250 tons of lead were installed, developed during the melting of a tremendous heat. This makes it extremely difficult to get the fire under control. France's interior state Secretary Laurent Nuñez said it was uncertain whether the house of God could be saved. The flames were not nearly three hours after the start of the fire is still under control. 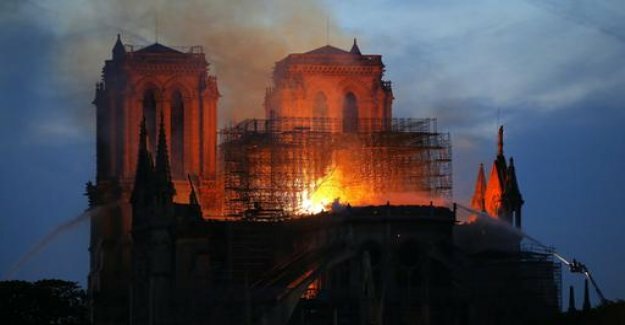 The fire Department showed itself to be sceptical: It was "not sure" whether the spread of the fire could be stopped, said a spokesman on the question of whether the world-famous Cathedral, it should be save to. The Northern bell should collapse tower, this would have unforeseeable consequences.